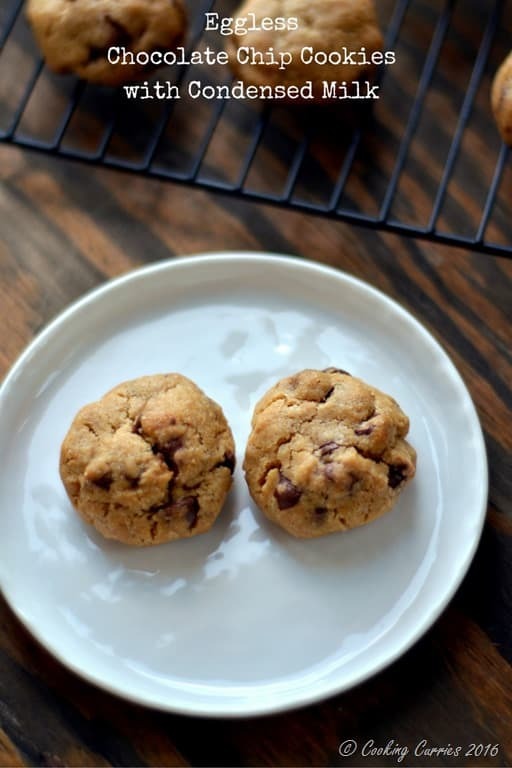 These eggless chocolate chip cookies have a secret ingredient – condensed milk, which makes them taste extra delicious to dunk in that glass of milk or to just eat them like that! 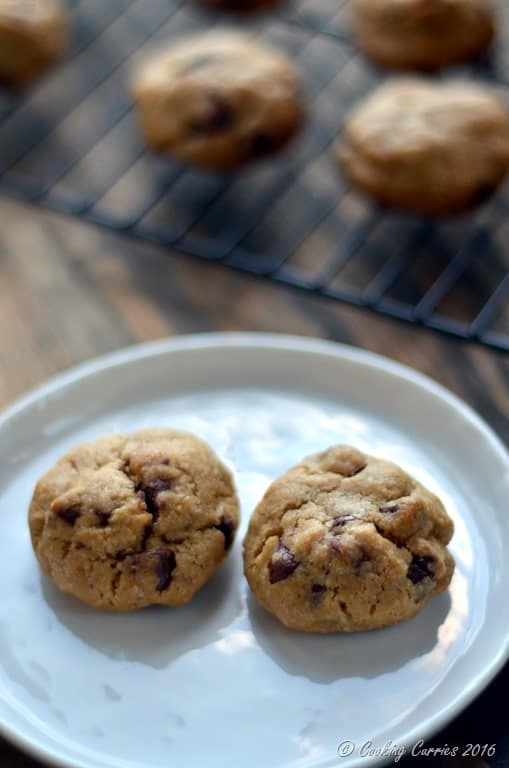 The basic yet classic Chocolate Chip Cookies can never get boring. 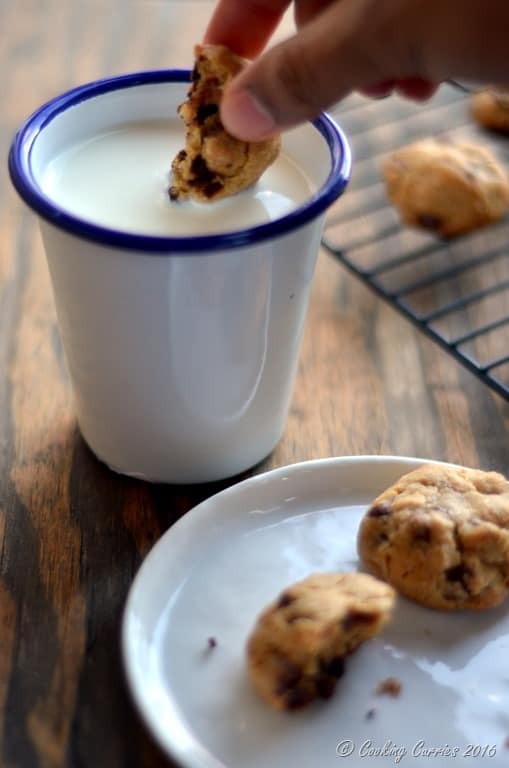 Though all cookies taste good when dunked in a glass of milk, there is something special about chocolate chip cookies. I love to eat chocolate chip cookies when they are warm. Warm enough to melt those chocolate chips ever so slightly that with each bite when you get part of the chocolate chip, its all gooey inside. Some of that silky melted chocolate sometimes colors your milk to make it look like chocolate milk. What’s not to love about that? I recently read somewhere about using condensed milk in baked goodies, just like how we sometimes use mashed bananas or apple sauce. I think it was a brownie recipe that I saw, but I wanted to try it out in a cookie. 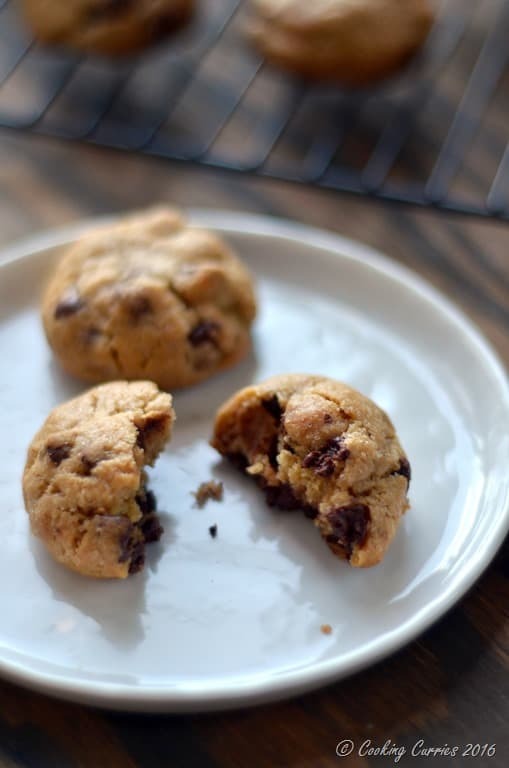 What better to try it out than in a chocolate chip cookie. I did some research and found out that you can substitute 1/4 cup condensed milk for every egg that you use in the recipe. My chocolate chip cookie recipe has one egg and so I substituted that with 1/4 cup condensed milk and voila! 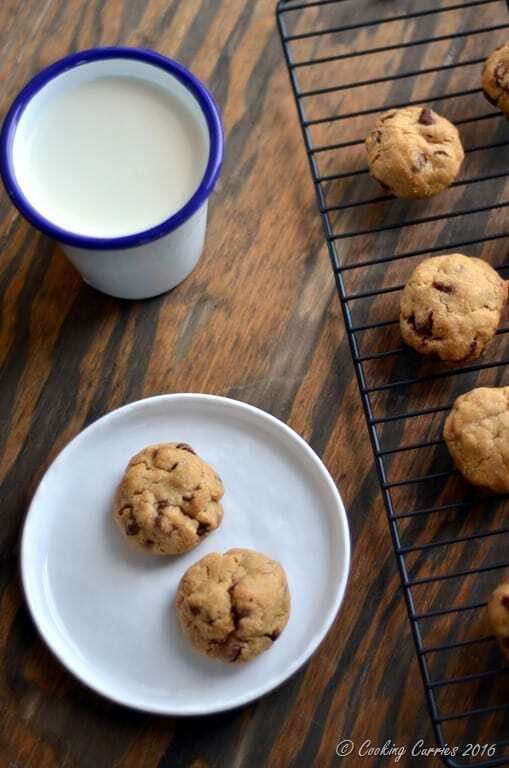 eggless chocolate chip cookies with condensed milk is here. I did however find that this is not as chewy as I would like my chocolate chip cookie to be and tends to harden a little when it gets cold. But warm it up a little and you are good to go with soft and chewy yet firm chocolate chip, perfect to be dunked in that glass of milk. Cream the butter and sugar with a stand mixer. Add the vanilla nad condensed milk and mix well. Mix the dry ingredients – flour, baking powder and salt together. Add this to the wet ingredients and mix it in. Add the chocolate chips to this and mix well. 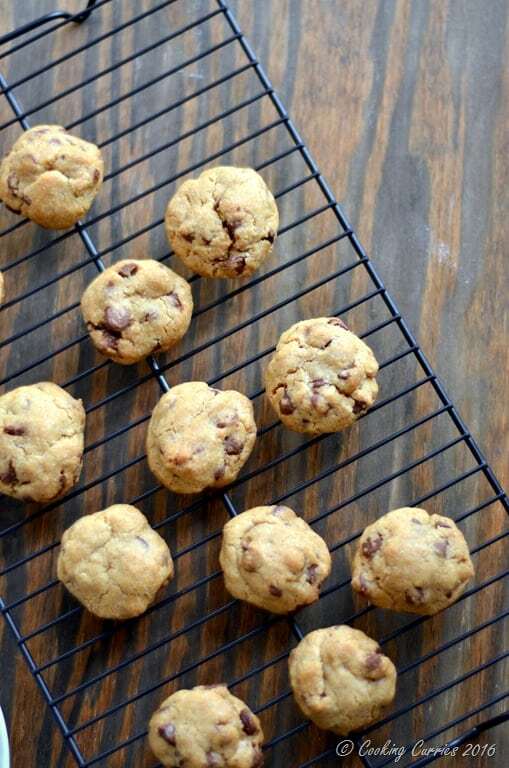 Drop a tablespoon each of the cookie dough on to a baking sheet lined with parchment paper. Bake for 15 mins. Cool completely on wire racks before storing in an airtight container. Or enjoy them warm.